You can keep the singles as a single ply yarn, or ply them together from a lazy kate. Single ply yarn is spun with what is called a Z-twist. Singles are often used for weaving and crochet projects. Two plied yarns are ideal for knitting projects. 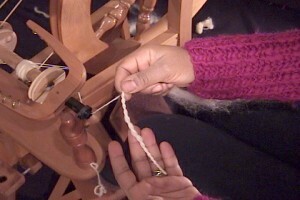 Plying is twisting two or more single threads together, in the opposite direction from which they were spun. Plying spins what is called a S-twist into the yarn. There are several variations on the method of plying, which affect the texture and appearance of the finished yarn. Begin by spinning two bobbins of spun singles. Place the bobbins into a bobbin rack, called a lazy kate. Some spinning wheel models will have the lazy kate built onto the spinning wheel. Or you will have a separate lazy kate that can be placed anywhere that is comfortable for you. Some handspinners set it on the floor and slightly behind them. You can also use a tensioning devise to ensure that the yarns will run off the bobbin evenly. This prevents high spun singles from snarling on each other and getting tangled. Put an empty bobbin on the spindle of the wheel, attach a leader, and thread it through the orifice. Tie the two ends of the spun yarn together, slip them into the loop of leader, and tie a knot. Turn the bobbin and treadle in the opposite direction than what was spun to make the singles (counter-clockwise). Adjust the tension a little tighter than when spinning the singles, so that the yarn will quickly wind on to the bobbin when the yarn is released. Hold the two yarns with the backhand and position the forefinger in between them to keep them separated. Pinch the yarn with the front hand as you treadle, and store up the twist. Release the hold and allow the twist to run down the yarn toward the backhand. Follow the twist with the front hand to smooth the yarn evenly. When the front hand meets the backhand, allow the plied yarn to wind onto the bobbin by moving the back hand toward the orifice. Slide the hand back again, and repeat the process. After plying a couple of yards of yarn, test to see if the correct amount of test is being used. Pull out a yard of yarn from the bobbin, hold it in your hand and let it fall slack. If the yarn twists back on itself it is being over-twisted. If it hangs loosely and holds the twist, the yarn is well balanced. The character, softness, and strength of the yarn will be determined by how much twist you put into the yarn. A balanced yarn is when the amount of Z twist and S twist is identical. If you find you are putting too much twist into the yarn, slow down your treadling, decrease the tension on the wheel, or use a larger whorl size. Plying is used to put more strength into a yarn. In the early stages of learning to spin, beginners will spin a lot of irregular singles. Plying these singles together will smooth out some of the irregularities, and also make an interesting novelty yarn.